After the sharp drop last Monday, prices climbed about a dollar a barrel to close at $68.26 in New York and $73.07 in London. Goldman Sachs continues to expect that Brent Crude prices could retest $80 a barrel this year, but probably only late in 2018. “Production disruptions and large supply shifts driven by US political decisions are the drivers of this new volatility, with demand remaining robust so far.” Brent Crude is expected to trade in the $70-$80 a barrel range in the immediate future. The OPEC Production Cut: Saudi Arabia plans to reduce crude exports next month by 100,000 b/d in August according to a Reuters report. Saudi Arabia—and Russia—had started to raise production even before the June 22 meeting with OPEC that sought to address the shrinking global oil supply and rising prices. Earlier this year, OPEC was over-complying with the cuts agreed to at the November 2016 meeting thanks to additional cuts from Saudi Arabia and Venezuela. The June 22nd meeting decided to increase production to more closely reflect the production cut agreement. After the meeting, Saudi Arabia pledged a “measurable” supply boost but gave no specific numbers. According to Iran’s news agency, Tehran’s oil minister warned his Saudi Arabian counterpart that the June 22nd revisions to the OPEC supply pact do not give member countries the right to raise oil production above their targets. The Saudis, Russia, and several of the Gulf Arab states increased production in June, but seem reluctant to expand much further. During the summer months, the Saudis need to burn raw crude in their power stations to combat temperatures that will be on the order of 110o to 115o Fahrenheit during the next few weeks. Wood Mackenzie’s latest long-term outlook for the worldwide oil supply says that OPEC and its partners will continue to play a crucial role in oil supply and prices in the global oil market through 2040, despite expectations for production increases in the US and other non-OPEC countries in the 2020s. US Shale Oil Production: According to the EIA’s latest Drilling Productivity Report, US unconventional oil production is projected to rise by 143,000 b/d in August to 7.470 million b/d. The Permian Basin is seen as far outdistancing other shale basins in monthly growth in August, at 73,000 b/d to 3.406 million b/d. However, drilled but uncompleted (DUC) wells in the Permian rose 164 in June to 3,368, one of the largest builds in recent months. Total US DUCs rose by 193 to 7,943 in June. 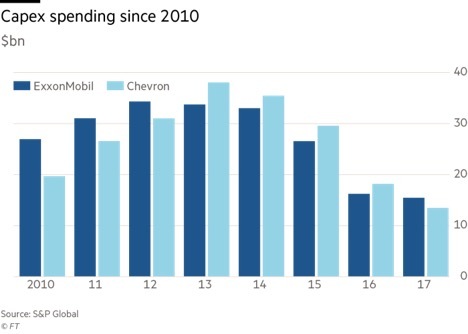 US energy companies last week cut oil rigs by the most in a week since March as the rate of growth has slowed over the past month or so with recent declines in crude prices. Included with the optimistic forecast for US shale oil was the caveat that the DUC and production figures are sketchy as current information is difficult for the EIA to obtain with little specific data being provided to Washington by E&Ps or midstream operators. Given all the publicity surrounding constraints on moving oil from the Permian to market, the EIA admits that it “may overestimate production due to constraints” in oil and gas takeaway capacity and that they “have watched [well completions] filings coming in and they are disappointing” over the last few weeks. The increasing DUC count in the Permian is an important concern. If oil and gas cannot find a way out of the basin, a growing number of wells will need to be banked for the next year or so and left uncompleted until new pipeline capacity comes online in Q3 2019. The number of DUCs has increased steadily in the last six months, with each month adding over 110 DUCs to inventory, month-on-month. Completion crews are scarce in the Permian and haven’t been able to keep up now for the last two years. Labor shortages also have helped contribute to delays in setting up facilities on site – that is, processing, pipelines, storage tanks — so some producers must wait to bring some wells online. Production in the Eagle Ford Shale of South Texas is forecasted to grow 35,000 b/d in August to 1.436 million b/d, while the Bakken Shale of North Dakota and Montana is forecast by the EIA to grow 15,000 b/d to 1.297 million b/d. The Anadarko Basin of Oklahoma and the Texas Panhandle is predicted to grow 10,000 b/d to 559,000 b/d, while the Niobrara Shale in Colorado and Wyoming is pegged to increase by 6,000 b/d to 611,000 b/d. The Appalachian Basin in Pennsylvania, Ohio and West Virginia is forecast at 4,000 b/d of oil growth in August to 118,000 b/d. The Haynesville Shale, in northeast Louisiana and east Texas, is expected to remain flat in oil output in August at 43,000 b/d. This speech to members of Rouhani’s cabinet is clearly aimed at the conservative elements in the government who have been critical of the President and his policies of cooperation with the West and a call for unity in a time that seems likely to be one of great economic difficulty for Iran. In late December, demonstrations which began over economic hardship spread to more than 80 Iranian cities and towns. At least 25 people died in the unrest, the most significant expression of public discontent in almost a decade. Demonstrators initially vented their anger over high prices and alleged corruption, but the protests took on a rare political dimension, with a growing number of people calling on Supreme Leader Khamenei to step down. The US has rebuffed high-level pleas from the European Union to grant exemptions to European companies from its sanctions against Iran. Secretary of State Pompeo said the US rejected the appeal because it wants to exert maximum pressure on Iran. He said exemptions would only be made if they benefited US national security. The EU fears that billions of dollars’ worth of trade could be jeopardized as a result of Washington’s new sanctions. Although there is much debate over the effectiveness of the impending US sanctions, some analysts are saying that Iran’s oil exports could fall by as much as two-thirds by the end of the year putting oil markets under massive strain amid supply outages elsewhere in the world. Some of the worst-case scenarios are forecasting a drop to only 700,000 b/d with most of Tehran’s exports going to China, and smaller shares going to India, Turkey and other buyers with waivers. China, the biggest importer of Iranian oil at 650,000 b/d according to Reuters trade flow data, is likely to ignore US sanctions. However, some in Washington now expect that China will import much of the Iranian oil that other nations won’t buy, according to a senior US government energy official. Beijing’s purchase of extra Iranian crude would dull the economic impact of Washington’s sanctions. Iraq: Iraq’s future is again in trouble as protests erupt across the country. These protests began two weeks ago in southern Iraq after the government was accused of doing nothing to alleviate a deepening unemployment crisis, water and electricity shortages and rampant corruption. The demonstrations are spreading to major population centers including Najaf and Amirah, and now discontent is stirring in Baghdad. The government has been quick to promise more funding and investment in the development of chronically underdeveloped cities, but this has done little to quell public anger. Iraqis have heard these promises countless times before, and with a water and energy crisis striking in the middle of scorching summer heat, people are less inclined to believe what their government says. Over the weekend the civil unrest has begun to diminish in southern Iraq, leaving the country’s oil sector shaken but secure – though protesters have vowed to return. Operations at several oil fields have been affected, as international oil companies and service companies have temporarily withdrawn staff from some areas that saw protests. The government claims that the production and exporting of oil has remained steady during the protests. With Iran refusing to provide for Iraq’s electricity needs, Baghdad has now also turned to Saudi Arabia to see if its southern Arab neighbor can help alleviate the crises it faces. Saudi Arabia: Saudi Aramco’s potential acquisition of a stake in petrochemicals company Sabic will affect the timing of an initial public offering, its chief executive said, throwing further doubt on the kingdom’s plans to sell shares in its state giant. The IPO has been touted for the past two years as the centerpiece of an ambitious economic reform program driven by crown prince Mohammed bin Salman to diversify the Saudi economy beyond oil. Saudi Arabia expects its crude exports to drop by roughly 100,000 b/d in August as the kingdom tries to ensure it does not push oil into the market beyond its customers’ needs, the Saudi’s OPEC governor said on Thursday. An industry source familiar with the matter said Saudi oil exports in June were about 7.2 million b/d, while the latest official figures show May exports at 6.984 million b/d. Libya: Just a few days after Libya reopened its eastern oil ports and started to ramp up production that had been offline for weeks, the National Oil Corporation (NOC) declared force majeure on crude oil loadings at the Zawiya port in the west, following an attack and abduction of oil workers at the Sharara oil field. Production at Sharara was expected to drop by 160,000 b/d after oil workers were abducted and oil wells closed as a precaution. Libya, however, is ramping up oil output at its eastern fields, offsetting the 160,000 b/d lost from the partial shutdown of the country’s biggest deposit after gunmen kidnapped workers there. Overall production rose from 650,000 to 700,000 b/d last week and is expected to rise further after shipments resume at eastern ports that re-opened after a political standoff. China’s economy expanded by 6.7 percent in the second quarter, its slowest pace since 2016. The pace of annual expansion announced is still above the government’s target of “about 6.5 percent” growth for the year, but the slowdown comes as Beijing’s trade war with the US adds to headwinds from slowing domestic demand. The gross domestic product had grown at 6.8 percent in the previous three quarters. The pace of growth in China’s crude imports may slow in the second half as lower runs at independent refiners, potential delays in the startup of some refineries and higher inventories curb demand. The first signs of weaker demand appeared in the June data, which showed imports falling 4.9 percent to a six-month low of 8.39 million b/d, marking the first year-on-year drop in 2018. Higher oil prices play a role in the slowing of demand, but the main factor is higher taxes on independent Chinese refiners, which is already cutting into the refining margins and profits of the ‘teapots’ who have grown over the past three years to account for around a fifth of China’s total crude imports. Under the stricter tax regulations and reporting mechanisms effective March 1, however, the teapots now can’t avoid paying a consumption tax on refined oil product sales—as they did in the past three years—and their refining operations are becoming less profitable. According to Reuters, Russia used stocks held at its oilfields to help boost crude production in June, as Saudi Arabia pushed other major producers to increase output. Russian oil production last month rose by around 100,000 b/d from May. From July 1-15, the country’s average oil output was 11.215 million b/d, an increase of 245,000 b/d from May’s production. Amid growing speculation that President Trump will attempt to weaken US sanctions on Russia’s oil sector, US congressional leaders are pushing legislation to strengthen sanctions on Russian export pipelines and joint ventures with Russian oil and natural gas companies. These efforts, still in their early stages in the House and Senate, could increase investment risk in Russia’s oil and gas sector and, potentially, hinder some export growth, analysts said this week. However, according to congressional sources, the US oil and gas industry already is lobbying against tighter sanctions on Russia that could impact US investments there. Ukraine and Russia said they would hold further European Union-mediated talks on supplying Europe with Russian gas, in a key first step toward renewing Ukraine’s gas transit contract that expires at the end of next year. Gazprom is planning to develop more of the huge natural gas resources on Yamal peninsula as it would expand its northern gas transmission corridor. With more natural gas from the Arctic feeding the northern export route to European markets Gazprom would be in a better position to feed the Nord Stream pipeline and the planned Nord Stream 2 project. Last week, Gazprom approved the development of the Kharasaveyskoye gas and condensate field and the gas transmission system, expected to begin in 2019 and to ship first gas in 2023. The company is betting that Yamal will become the largest natural gas production center in Russia and replace the dwindling reserves of the Nadym-Pur-Taz region. Shell has again started talks for the $2-billion sale of two Nigerian oil licenses and their infrastructure assets, according to Bloomberg, after four years of failed attempts to offload the contentious assets. This latest round of talks are taking place with a Nigerian entity that has not secured financing for the deal, and like similar talks before this, they may collapse. Shell has been trying to refocus its Nigerian operations offshore to avoid unending local opposition to its activities, on-again-off-again militant attacks on its assets, and a quagmire surrounding accusations that it destroyed the Niger Delta with spills and failed to clean up after itself. Offshore, everything is less risky. But these remaining two onshore licenses have proven difficult to unload. Venezuela’s Oil Minister Manuel Quevedo has been talking about plans to raise the country’s crude oil production in the second half of the year. However, no one else thinks or claims that Venezuela could soon reverse its steep production decline which has seen it losing more than 40,000 b/d of oil production every month for several months now. According to OPEC’s secondary sources in the latest Monthly Oil Market Report, Venezuela’s crude oil production dropped in June by 47,500 b/d from May, to average 1.340 million b/d in June. In the midst of a collapsing regime, widespread hunger, and medical shortages, President Nicolas Maduro continues to grant generous oil subsidies to Cuba. After the fall of the Soviet Union, Cuba turned to Venezuela for subsidized crude oil, in exchange for sending skilled laborers and medical personnel to work in Venezuela. Havana also provided the Chavez government with intelligence and security personnel which helped the government control dissidence, which may be a factor in Maduro’s reluctance to cut ties with Havana. Last year Venezuela cut off exports to Cuba for eight months, but then began sending shipments of light oil to Cuba in March 2017 at a great cost to their own refineries, which are running at just a small fraction of their capacity thanks to lack of funds for maintenance. Last week, there was a reported shipment of 500,000 barrels of Venezuelan crude to northwestern Cuba. It is believed that Venezuela continues to supply Cuba with around 55,000 barrels of oil per day, costing the nation around $1.2 billion per year.